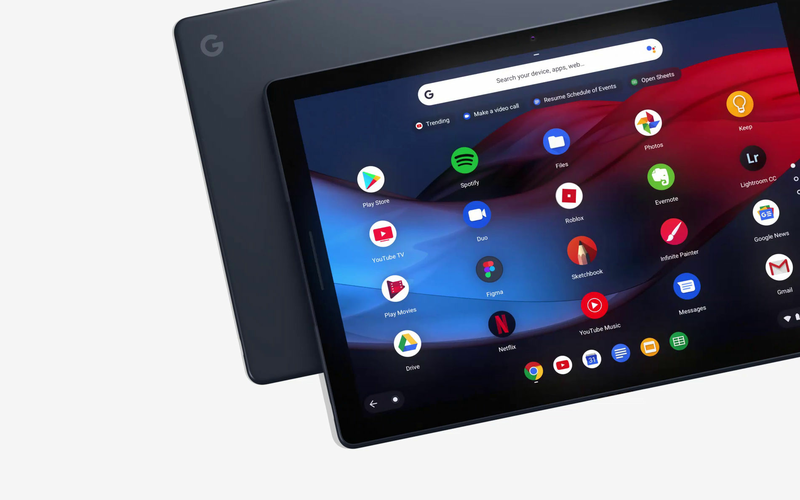 Alongside the Pixel 3, Pixel 3 XL (review), and Home Hub, Google unveiled a new tablet/laptop hybrid called the Google Pixel Slate. We had already brought you exclusive renders of this device well before it launched. As predicted, this device is the first tablet from the company to come with Chrome OS. Furthermore, it works with a detachable keyboard and is compatible with the Pixelbook Pen. Google Pixel Slate price starts at $599. 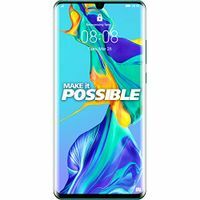 It was launched on 9th October 2018. The variant with an Intel i7 8th Gen CPU costs $1,599. It will come in only one color option called Midnight Blue. 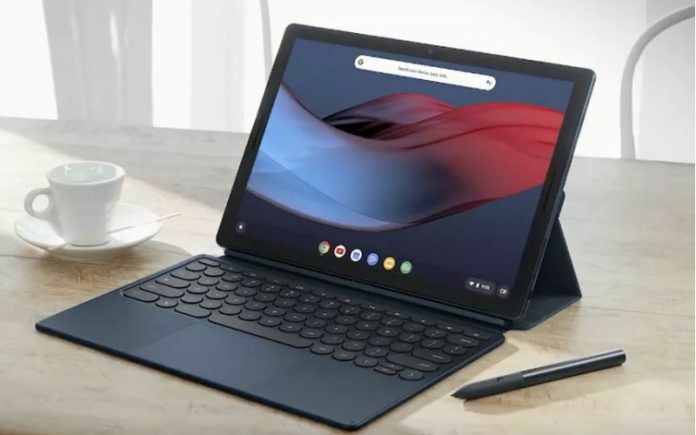 The Google Pixel Slate is first and foremost a tablet that comes with a 12.3-inch touchscreen LCD. This display holds a 2:3 aspect ratio and offers a 2000 x 3000 pixels resolution. There are noticeably large bezels around this screen which come in handy when using this in tablet mode. To use it in laptop mode, you can attach a Pixel Slate Keyboard which needs to be purchased separately. This keyboard doubles as a stand and folio case for the Pixel Slate that attaches using magnetic connectors. It can be folded away without the need to be detached if you want to continue using the Pixel Slate in tablet mode. When in use, this keyboard offers backlit keys with a decent tactile feedback and surprisingly quiet operation. Without this keyboard, the Pixel Slate weighs in at 721g, which is reasonable considering how large the screen is. This 2-in-1 comes with dual front-facing stereo speakers that get surprisingly loud. Both the front and back of this tablet offers 8MP cameras that support up to 1080p video recording. There are two USB-C ports, one on either side of the Pixel Slate. Both can be used for charging, data transfers, and as outputs for 4K displays. Also, the power button has an inbuilt fingerprint scanner for added security. Unfortunately, there is no 3.5mm headphone jack provided for wired headsets. The Google Pixel Slate runs the latest version of Chrome OS. While the road to a smooth user experience on this OS has been bumpy, to say the least, Google has put enough effort behind it that the usability is quite pleasant. Firstly, the Pixel Slate can run Android applications. Furthermore, it offers a full desktop-class version of Chrome. The windowing system has been improved to help moving applications around. And, it even offers support for some Linux applications. Chrome OS on the Pixel Slate is smart enough to know when the keyboard has been detached. It will automatically shift from laptop mode to tablet mode depending on this. In tablet mode, there are new, more intuitive gestures for switching between, closing, and triggering split-screen for applications. Some apps also support picture-in-picture mode. The Pixel Slate also offers compatibility with the Pixelbook Pen. The experience of using this is a mixed bag. Not only do you have to buy the stylus separately, but there is also no attachment mechanism provided. This makes it harder for someone to carry it around. Price-to-performance is also a matter worth considering when deciding to purchase the Pixel Slate. Looking at this from a real-world productivity point of view, Chrome OS just cannot match up to Windows and macOS. On the other hand, if the Chrome OS experience is what you are looking for, even the entry-level model is priced at a considerable premium if you take into account the added costs of the stylus and keyboard. This makes the Pixel Slate a hard sell considering you can get a similar experience with something like the Samsung Chromebook Pro v2 that comes with a keyboard and stylus for $500.